Okay, this is my final wedding post! Like I mentioned in an earlier post, the theme of our fall beach wedding was simplicity. We also wanted to keep with the season and be local as much as possible. But my mom and I couldn’t help but get a little crafty on a few things. Well, we saved a lot of fussing with envelopes with our DIY wedding postcards. Then, there were the party favors. Inspired by salt dough ornaments on Pinterest, I really liked the styles I saw by this company on Etsy. See, I happened to have a bunch of old flour I would never cook with & kosher salt that Kevin had bought for cheesemaking that he didn’t want because it had some weird ingredient in it. Since the only other ingredient for salt dough is water, we were there. I followed this recipe (these are cute, too!). To make sure they didn’t look grainy I ground my salt in the coffee grinder until it was really smooth. I tried to use paint to stamp instead of ink, and it didn’t work very well! So I ended up painting the words in later, which was time consuming and would probably be really challenging if you aren’t used to working with a small paintbrush. Also, I had some ornaments that I decided to let air dry instead of baking & several of them cracked weeks later- so I do recommend the baking. Sanding the edges really made a difference for a more finished look. Choosing words and spending all that time painting them in gave me a calm way to soothe my nerves in the days leading up to the wedding, and it was nice to focus on the meaning of each word, and how I envisioned it in Kevin and I’s life together. And guess what all the extras ended up making? Very cute Christmas tree ornaments. Now every Christmas we will have a tree that reminds us of our intentions on our wedding day. Then there were the bird seed ornaments. 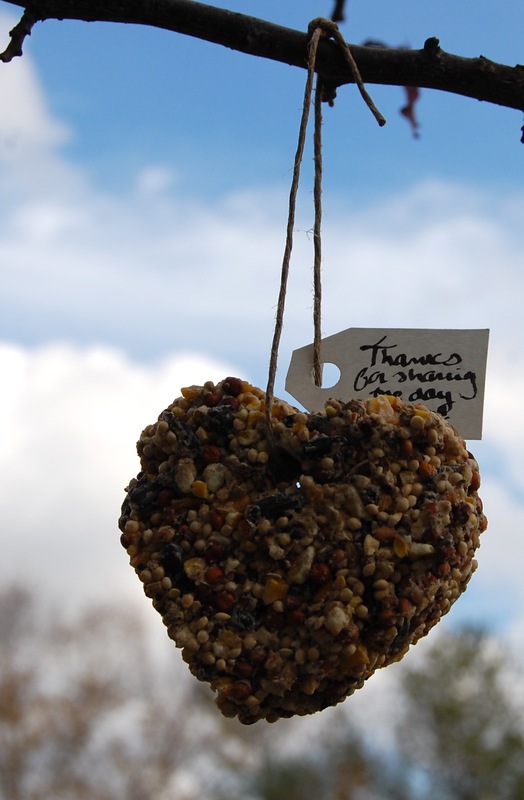 This was a fall wedding, and I thought it perfect to hang out bird seed for the birds in the time of year when winter is just around the corner. Since we are huge lovers of nature and wildlife, this really fit for us. My mother makes soap. They are great, really natural and one of the only soaps that doesn’t strip my skin. People with all sorts of skin issues like eczema ask for my mothers soaps, so I was happy to have them in the bags. My mother also got crafty with some white chocolates in wedding bell molds. We threw in a few salt water taffys from the local Candy Kitchen for a beach themed treat. I bought a real starfish once from the craft store. Kevin gave me a sort of surprised/horrified look when I got home. “You know where they get those right? They pull them right out of the ocean alive & leave them to dry out on the rocks and die.” Hmm. Buzzkill. But I had to agree with him. Especially when we were in India and saw a man pull a live conch shell out of the water and then try to sell it to us. I decided never to buy another starfish again, and to use that original one to make plaster imitations. I used Shabby Creek Cottage’s tutorial to make plaster starfish a few days before the wedding. It was perfect since we were already at the beach and you use sand to make the molds. The starfish tied to the candle holder was inspired by Pottery Barn. Tables were set with sea shells collected from our travels and sand from the beach right outside the door. You can’t tell it from the pictures below, but the entire backdrop to the room is a gorgeous view of the ocean. Since we did not use chairs on the beach, I used a shepherd’s hook to indicate the spot where people should gather. I sewed tiny white rosettes, and small seashells with holes in them on some sheer ribbon. I wrapped the pole twice with ribbon. Because it was sheer the black showed through a little- if I did something similar again, I would get an opague ribbon for the pole. Now, I kept insisting that for flowers all I wanted were white mums. They were local and in season, and had a simplicity that I really liked. I was pretty sure that people were doubting my sanity, but I wanted to make the bouquet from mums, too. Especially since I saw how easy it could be at Young House Love’s Blog here. Problem was, I was having a problem finding white mums till my mom and I were driving down Route 1 and came across the largest mums I have ever seen. I managed to trim some flowers off from around the bottom. Thankfully Chrissy, our caterer, stepped in and helped me tie it with floral tape and white ribbon. It turned out just as I pictured and there was still plenty of mum left! We set the mum on its own table in the middle of the room for effect. I can’t even tell you the price on that- it’s too ridiculous. Pardon the pictures, they are from my apartment complex. I had intended to get one taken on the wedding day, but completely forgot to mention it to the photographer. 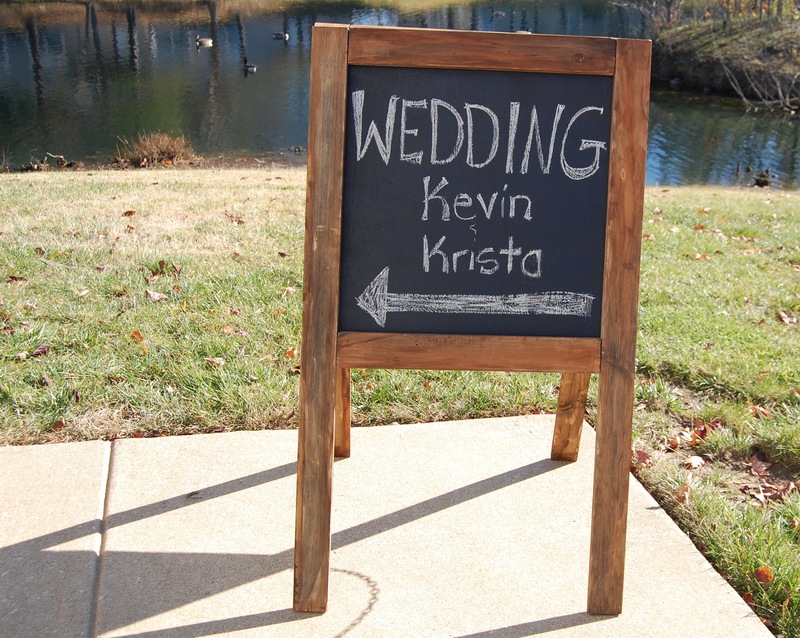 As for the chalkboard, I had intended this to be a cheap DIY, but it wasn’t that cheap to buy supplies, almost $50 because Kevin was more concerned with it looking a certain way than price. And I wonder if you could just buy a chalkboard cheaper… Oh well, I love it and will find a place for it eventually! Ha ha. That’s okay- glad you guys were there- that’s what really made it special!